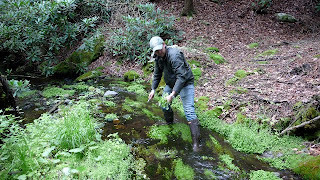 ON A MUSHROOM HUNT THIS PAST SUMMER I REALIZED (THROUGH SOME ADVICE AND OBSERVATION) THAT I HAD BEEN PASSING WATERCRESS IN THE STREAMS WHEN FISHING FOR TROUT, IN THE CATSKILLS NEAR MY FARM. IT'S CRAZY HOW OBVIOUS IT BECOMES ONCE YOU OPEN YOUR EYES TO IT. THERE IS NOTHING BETTER THAN APPLEWOOD SMOKED TROUT OVER A BED OF WILD WATERCRESS. 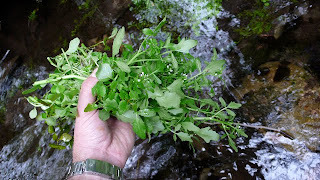 I don't want to dampen you enthusiasm for foraging but with wild watercress you need to be SERIOUSLY careful of liver flukes.